As science reaches further out into the Cosmos, we sense the vast network of intelligence operating just a thought away from the frequency of our physical senses. 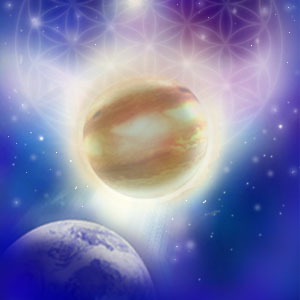 Rudolf Steiner used his wide perception to connect with the beings on the planet Jupiter, for instance; he described the ways in which their evolution was beyond the human race in terms of intelligence, wisdom and the capacity to live life from unconditional love. And the astronaut Edgar Mitchell became famous not so much for spending nine days in space but for the change in awareness that the experience catalyzed within him: overwhelmed by the visceral knowing that the Universe is a vast field of pulsating energy, every cell and every being inter-connected, he allowed his experience to transform him, and this change stimulated a gradual but profound change in scientific thinking. Very few of us are gifted with the vision of a Steiner, or the opportunity to explore the Moon. Psychically and physically, we cannot reach that far; so the energetic frequencies of those places come to meet us here instead. For what we can do, thanks to the grace of the Divine, is to receive some of the frequencies carried by those distant bodies, by means of the frequencies that Metatron offers as he folds down the energies of the Universe to meet us on the ground. Metatronic Cosmic Transmissions bring in planetary energies that fine-tune your subtle physiology, expanding it while also building its strength. It aligns your consciousness with these higher planes of awareness, Saturn strengthen your sense of discipline, for instance, while Sirius sets alight the flames of light and wisdom in your heart; Pluto may push you into deeper understanding of your hidden constrictions while the Moon awakens you to the feminine intuition which delivers you beyond illusion. Coming from realms so far away, these frequencies are like the high-potency homeopathic: they bring the light of Metatron’s wisdom and love to penetrate your energetic and physical DNA – the deepest and densest embodiment of all that you have become. Radical forgiveness is the overall theme: your sense of Oneness will shift from an intellectual concept to a visceral and cellular one, as the frequencies reach deep into your physical body, quickening your contact both with your own soul and the over-soul of the created world. This helps you to clear core issues associated with wider influences: educational, cultural, religious, governmental. Where one part of a system is out of balance in our interdependent global organism, it affects its whole body: a human organ, a corporation, a country, so we begin to sense the “how” of Metatron’s intention that the work would be transpersonal as well as personal. As the Universal energies permeate your consciousness, they bring a formidable energetic upgrade, amplifying the Metatronic frequencies that you have received at previous stages, while further refining your own energies as well as your effectiveness as a healer if this is your path. Metatronic practitioners have found that the effects of these energies ripple markedly through their client work, bringing increased depth, clarity and power. What New Skills Will I Develop? Healing happens layer on layer and at every stage, your clarity is heightened, your emotional intelligence honed, and your self-remembrance deepened. Since the planets are at the very outer limits of our visible universe, stretching as far as the eye and our technology can see, and this Course brings you the energies, wisdom and information of off-planet intelligence, this stage completes the core processes of your Metatronic ‘wiring’: your far-reaching energetic network, or Metatronic grid, is comprehensive and strong. While this honing naturally modifies and enhances your growing awareness and allows your spiritual power to step up another level as your wisdom and understanding deepen, it also grows your Metatronic ‘toolbox’. Your capacity to connect intuitively with clients – or for non-practitioners, simply with those who share your life – is enhanced. The thorough wiring process also ensures you will be able to offer effective distant healing. “Every single transmission within the system is there for a reason, doing its work which is subsequently emphasized by the following transmission and energies so the energetic system becomes more and more powerful every step of the way. It simply cannot be devised by a human mind, it is purely given by a higher power. Bless you!” Marie H, London. This course is open to all who have completed the Crystal Radiance Course. Its completion qualifies you for the awesome, beautiful energies that Metatron gifts us with as you take A Walk with the Masters.